The riding boot is an iconic symbol of the horse-centered life. There’s a saying, “A man is known by his boots.” (Undoubtedly also true for women!) With a single glance at your footwear, people can tell you spend your fair share of time in the saddle. Our amazingly talented master jewelry craftsman have created this exclusive design specifically for our customers. 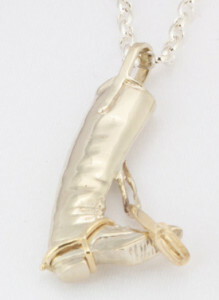 Created in sterling silver and the finest 14K gold, this detailed riding boot pendant is a eye-catching 2 1/2 inches long. You’ll love the substantial feel of this pendant – not to mention the way it instantly connects you with other riders. The golden stirrup and spur are moveable, meaning you can adjust this pendant to look the way you like it best. We sell this pendant with an adjustable (up to 20 inches) silver rolo chain. Like all of the fine horse jewelry we sell, this pendant comes in our gift box – something to keep in mind as the holidays approach! In the same line, but a little easier on the budget, the sterling silver tall boot charm makes a great addition to your horse-themed charm bracelet or worn as a pendant. 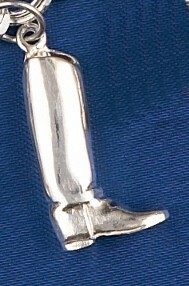 An inch tall by half an inch wide, the sterling silver tall boot charm is made here in the USA by our master craftsman. It’s a great hunting boot and would be a welcome addition to a fox-hunting charm bracelet. Charm bracelets continue to be one of the strongest trends in fine horse jewelry. Charms make a great gift for a friend, family member, or for yourself! When any one of our relations was found to be a person of a very bad character, a troublesome guest, or one we desired to get rid of, upon his leaving my house I ever took care to lend him a riding-coat, or a pair of boots, or sometimes a horse of small value, and I always had the satisfaction of finding he never came back to return them. That’s from Oliver Goldsmith. We wish we met him while he was in the habit of handing out horses!